You are here: Home / blog / Carpal Tunnel / Do I Need Carpal Tunnel Surgery? If pressure on the median nerve continues, however, it can lead to nerve damage and worsening symptoms. To prevent permanent damage, surgery to take pressure off the median nerve may be recommended for some patients. The carpal tunnel is a narrow passageway in the wrist, about an inch wide. The floor and sides of the tunnel are formed by small wrist bones called carpal bones. Reproduced and adapted from Rodner C, Raissis A, Akelman E: Carpal tunnel syndrome. Orthopaedic Knowledge Online Journal. Rosemont, IL, American Academy of Orthopaedic Surgeons, 2009; 7(5). Accessed March 2016. 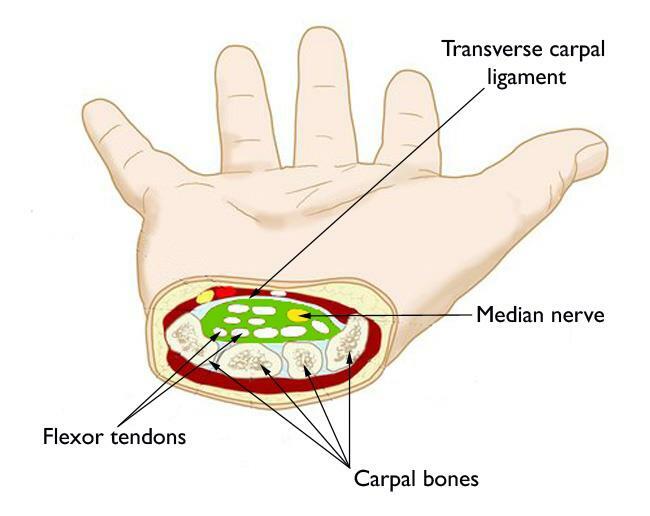 The roof of the tunnel is a strong band of connective tissue called the transverse carpal ligament. Because these boundaries are very rigid, the carpal tunnel has little capacity to “stretch” or increase in size. The median nerve is one of the main nerves in the hand. It originates as a group of nerve roots in the neck. These roots come together to form a single nerve in the arm. The median nerve goes down the arm and forearm, passes through the carpal tunnel at the wrist, and goes into the hand. The nerve provides feeling in the thumb and index, middle, and ring fingers. The nerve also controls the muscles around the base of the thumb. The nine tendons that bend the fingers and thumb also travel through the carpal tunnel. These tendons are called flexor tendons. 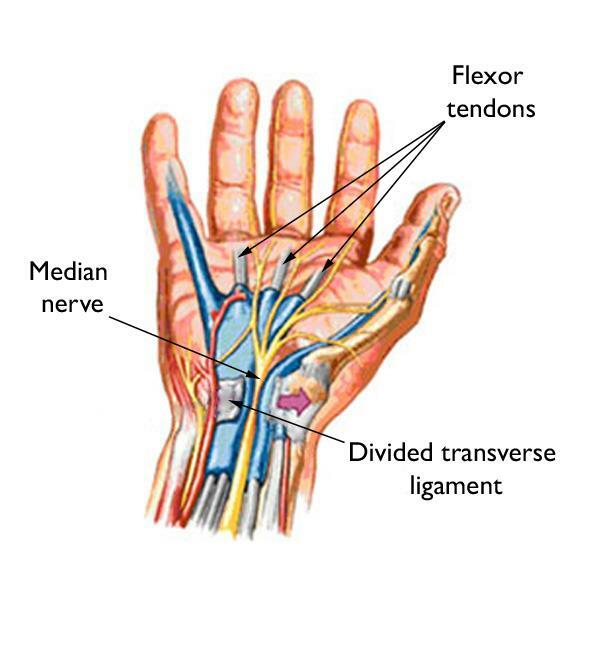 Carpal tunnel syndrome occurs when the tunnel becomes narrowed or when tissues surrounding the flexor tendons swell, putting pressure on the median nerve. These tissues are called the synovium. Normally, the synovium lubricates the tendons, making it easier to move your fingers. When the synovium swells, it takes up space in the carpal tunnel and, over time, crowds the nerve. This abnormal pressure on the nerve can result in pain, numbness, tingling, and weakness in the hand. Carpal tunnel syndrome is caused by pressure on the median nerve as it travels through the carpal tunnel. Most cases of carpal tunnel syndrome are caused by a combination of factors. Studies show that women and older people are more likely to develop the condition. In most cases, the symptoms of carpal tunnel syndrome begin gradually—without a specific injury. Many patients find that their symptoms come and go at first. However, as the condition worsens, symptoms may occur more frequently or may persist for longer periods of time. Night-time symptoms are very common. Because many people sleep with their wrists bent, symptoms may awaken you from sleep. During the day, symptoms often occur when holding something for a prolonged period of time with the wrist bent forward or backward, such as when using a phone, driving, or reading a book. Many patients find that moving or shaking their hands helps relieve their symptoms. During your evaluation, your doctor will talk to you about your general health and medical history and will ask about your symptoms. Test sensitivity in your fingertips and hands by lightly touching them with a special instrument when your eyes are closed. Look for atrophy in the muscles around the base of your thumb. In severe cases, these muscles may become visibly smaller. To perform Tinel’s test for nerve damage, your doctor will tap on the inside of your wrist over the median nerve. Electrophysiological tests. These tests will help your doctor measure how well your median nerve is working and help determine whether there is too much pressure on the nerve. The tests will also help your doctor determine whether you have another nerve condition, such as neuropathy, or other sites of nerve compression that might be contributing to your symptoms. Nerve conduction studies. 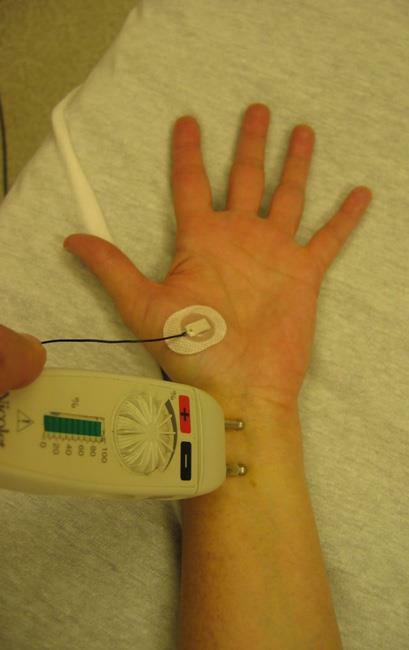 These tests measure the signals travelling in the nerves of your hand and arm and can detect when a nerve is not conducting its signal effectively. Nerve conduction studies can help your doctor determine how severe your problem is and help to guide treatment. Electromyogram (EMG). An EMG measures the electrical activity in muscles. EMG results can show whether you have any nerve or muscle damage. Ultrasound. An ultrasound uses high-frequency sound waves to help create pictures of bone and tissue. Your doctor may recommend an ultrasound of your wrist to evaluate the median nerve for signs of compression. X-rays. X-rays provide images of dense structures, such as bone. If you have limited wrist motion or wrist pain, your doctor may order x-rays to exclude other causes for your symptoms, such as arthritis, ligament injury, or a fracture. Magnetic resonance imaging (MRI) scans. These studies provide better images of the body’s soft tissues. Your doctor may order an MRI to help determine other causes for your symptoms or to look for abnormal tissues that could be impacting the median nerve. An MRI can also help your doctor determine if there are problems with the nerve itself—such as scarring from an injury or tumor. Although it is a gradual process, for most people carpal tunnel syndrome will worsen over time without some form of treatment. For this reason, it is important to be evaluated and diagnosed by your doctor early on. In the early stages, it may be possible to slow or stop the progression of the disease. If diagnosed and treated early, the symptoms of carpal tunnel syndrome can often be relieved without surgery. If your diagnosis is uncertain or if your symptoms are mild, your doctor will recommend nonsurgical treatment first. Wearing a splint or brace reduces pressure on the median nerve by keeping your wrist straight. Bracing or splinting. 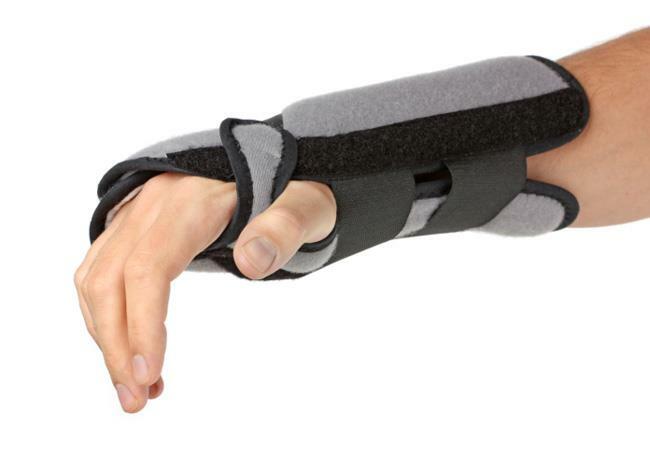 Wearing a brace or splint at night will keep you from bending your wrist while you sleep. Keeping your wrist in a straight or neutral position reduces pressure on the nerve in the carpal tunnel. It may also help to wear a splint during the day when doing activities that aggravate your symptoms. Nonsteroidal anti-inflammatory drugs (NSAIDs). Medications such as ibuprofen and naproxen can help relieve pain and inflammation. Activity changes. Symptoms often occur when your hand and wrist are in the same position for too long—particularly when your wrist is flexed or extended. If your job or recreational activities aggravate your symptoms, changing or modifying these activities can help slow or stop progression of the disease. In some cases, this may involve making changes to your work site or work station. 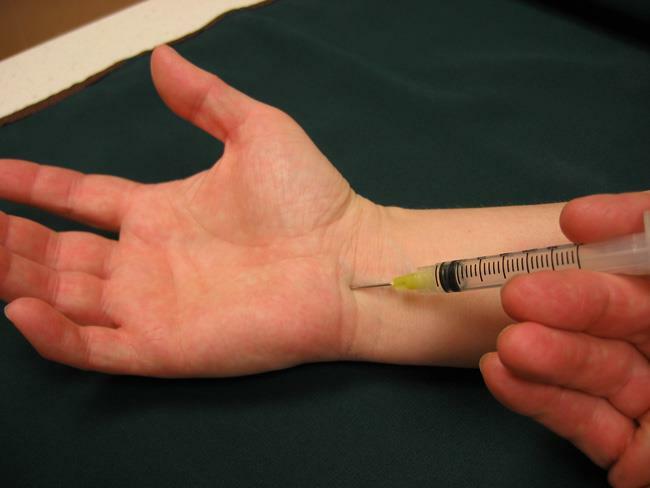 A steroid injection into the carpal tunnel may relieve symptoms for a period of time. Nerve gliding exercises. Some patients may benefit from exercises that help the median nerve move more freely within the confines of the carpal tunnel. Specific exercises may be recommended by your doctor or therapist. Steroid injections. Corticosteroid, or cortisone, is a powerful anti-inflammatory agent that can be injected into the carpal tunnel. Although these injections often relieve painful symptoms or help to calm a flare up of symptoms, their effect is sometimes only temporary. A cortisone injection may also be used by your doctor to help diagnose your carpal tunnel syndrome. If nonsurgical treatment does not relieve your symptoms after a period of time, your doctor may recommend surgery. The decision whether to have surgery is based on the severity of your symptoms—how much pain and numbness you are having in your hand. In long-standing cases with constant numbness and wasting of your thumb muscles, surgery may be recommended to prevent irreversible damage. The surgical procedure performed for carpal tunnel syndrome is called a “carpal tunnel release.” There are two different surgical techniques for doing this, but the goal of both is to relieve pressure on your median nerve by cutting the ligament that forms the roof of the tunnel. This increases the size of the tunnel and decreases pressure on the median nerve. 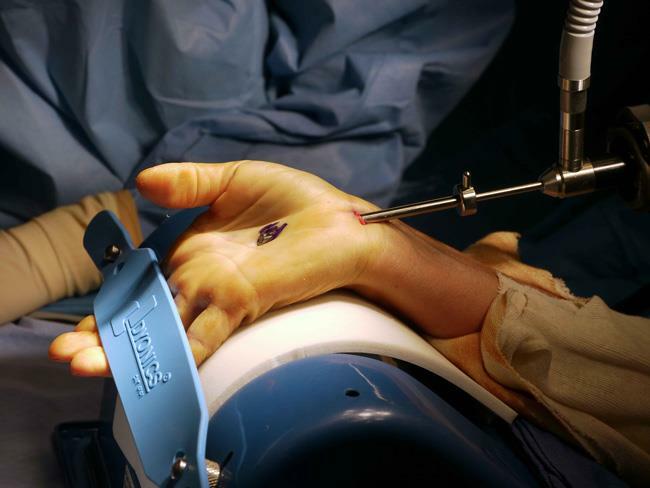 The transverse carpal ligament is cut during carpal tunnel release surgery. When the ligament heals, there is more room for the nerve and tendons. In most cases, carpal tunnel surgery is done on an outpatient basis. The surgery can be done under general anesthesia, which puts you to sleep, or under local anesthesia, which numbs just your hand and arm. In some cases, you will also be given a light sedative through an intravenous (IV) line inserted into a vein in your arm. Open carpal tunnel release. In open surgery, your doctor makes a small incision in the palm of your hand and views the inside of your hand and wrist through this incision. During the procedure, your doctor will divide the transverse carpal ligament (the roof of the carpal tunnel). This increases the size of the tunnel and decreases pressure on the median nerve. After surgery, the ligament may gradually grow back together—but there will be more space in the carpal tunnel and pressure on the median nerve will be relieved. Endoscopic carpal tunnel release. In endoscopic surgery, your doctor makes one or two smaller skin incisions—called portals—and uses a miniature camera—an endoscope—to see inside your hand and wrist. A special knife is used to divide the transverse carpal ligament, similar to the open carpal tunnel release procedure. Here, an endoscope is inserted through a portal in the patient’s wrist. A cutting instrument will be inserted in the palm. The outcomes of open surgery and endoscopic surgery are similar. There are benefits and potential risks associated with both techniques. Your doctor will talk with you about which surgical technique is best for you. Immediately following surgery, you will be encouraged to elevate your hand above your heart and move your fingers to reduce swelling and prevent stiffness. You should expect some pain, swelling, and stiffness after your procedure. Minor soreness in your palm may last for several weeks to several months. Grip and pinch strength usually return by about 2 to 3 months after surgery. If the condition of your median nerve was poor before surgery, however, grip and pinch strength may not improve for about 6 to 12 months. You may have to wear a splint or wrist brace for several weeks. You will, however, be allowed to use your hand for light activities, taking care to avoid significant discomfort. Driving, self-care activities, and light lifting and gripping may be permitted soon after surgery. Your doctor will talk with you about when you will be able to return to work and whether you will have any restrictions on your work activities. For most patients, surgery will improve the symptoms of carpal tunnel syndrome. Recovery, however, may be gradual and complete recovery may take up to a year. If you have significant pain and weakness for more than 2 months, your doctor may refer you to a hand therapist who can help you maximize your recovery. If you have another condition that causes pain or stiffness in your hand or wrist, such as arthritis or tendonitis, it may slow your overall recovery. In long-standing cases of carpal tunnel syndrome with severe loss of feeling and/or muscle wasting around the base of the thumb, recovery will also be slower. For these patients, a complete recovery may not be possible. Occasionally, carpal tunnel syndrome can recur, although this is rare. If this happens, you may need additional treatment or surgery.